I used to work in a record store. Great job, got discounts on all my Depeche Mode stuff. Anyway, one of my responsibilities was cashier. Did not like it too much, but hey, it was a job. A Job I sucked at. I much rather walk the floor and rearrange the CD's and help out the customers. Where was I? Oh, the cashier part. As with all retailers, we as cashiers were told to ask the customer for valid identification upon use of a credit card. A debit card, on the other hand, did not warrant such procedure since the PIN would confirm your relation to your card. This practice was strictly enforced. I once caught a guy who used his mom's card. The name on card did not match the name on the license. The manager on duty canceled the transaction and the guy left frustrated...without his CD's. What is my point? There is a flaw in the system. Like many out there, I hardly carry cash. Most of my purchases are made by credit card. That being said, I noticed that the cashier only asks for your ID when you are buying things. This rule does not apply to restaurants. You can buy something for five dollars at, for example, Target, using your credit card. They will ask you for valid form of identification. Then go to a restaurant like Islands, order twenty or a hundred dollars of food, pay for it with the same card...they will just run it through, no questions asked. This process of verifying documents is to protect the card holder of fraud and basically the unauthorized use of said card. But why check it only at retail and not at restaurants? On a side note: Most cashiers, if anything, only look to see that the name on your ID matches the name on your credit card. Some do not even look at the picture to see if you match the photo. 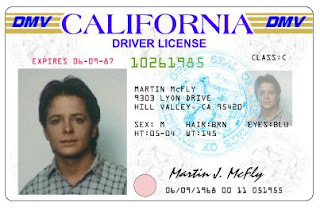 To prove my point, I had one of those credit cards with my photo on the front...they still ask for ID!?! Even when I pointed out that there is a photo of my on the credit card, they insist on proof of identity.